No affiliate or promotional links are present on this article. 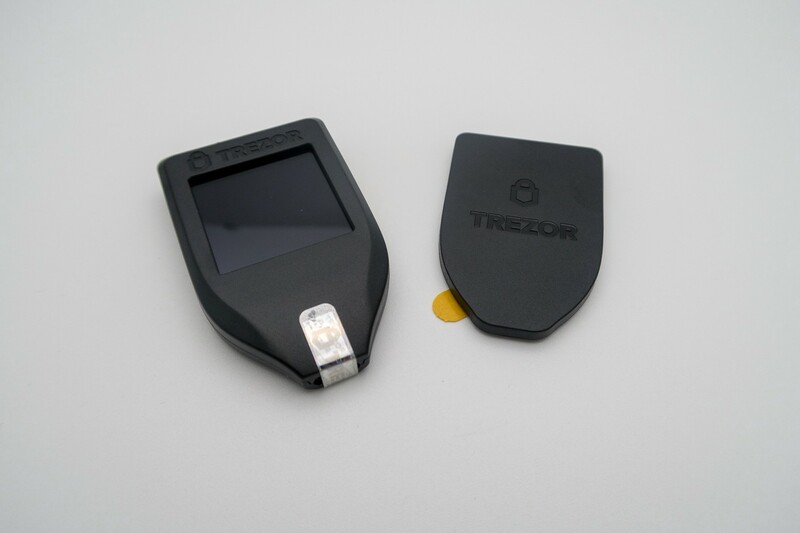 TREZOR Model T! The next-generation hardware wallet, designed and developed by SatoshiLabs. We are sure you want to start using your device as soon as possible, so let’s have a quick but thorough walkthrough of the setup process and basic functionalities of your new secure wallet. If you have formerly used a TREZOR One before, there are some differences you will need to get used to. The Model T uses a touchscreen, relinquishing the need for physical buttons. There are more differences, which we will address as we go through the onboarding process. What is in the package? 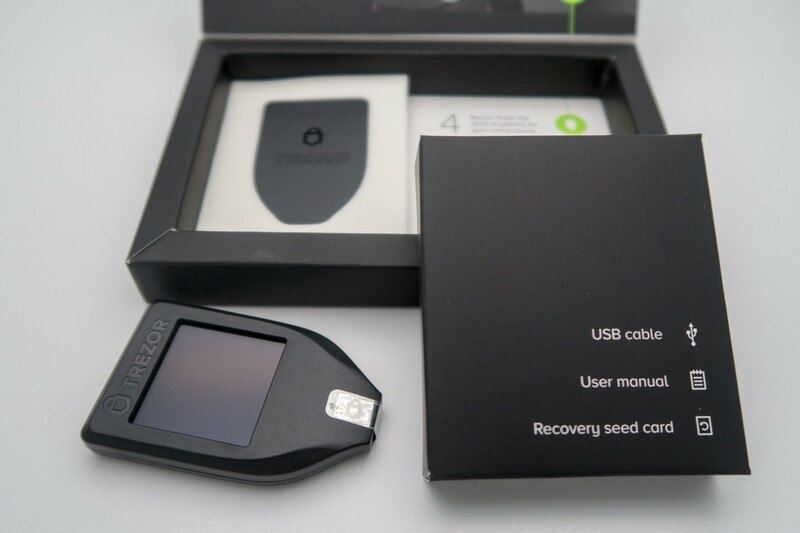 The TREZOR Model T comes in a completely redesigned packaging, reflecting the fresh nature of the device. Slide away the white sleeve to get closer to your new hardware wallet. The black case is held together by glue and a magnet. To get to your TREZOR, flip away the fold on the lower part of the case, and lift up the cover. The Model T is within your reach now! 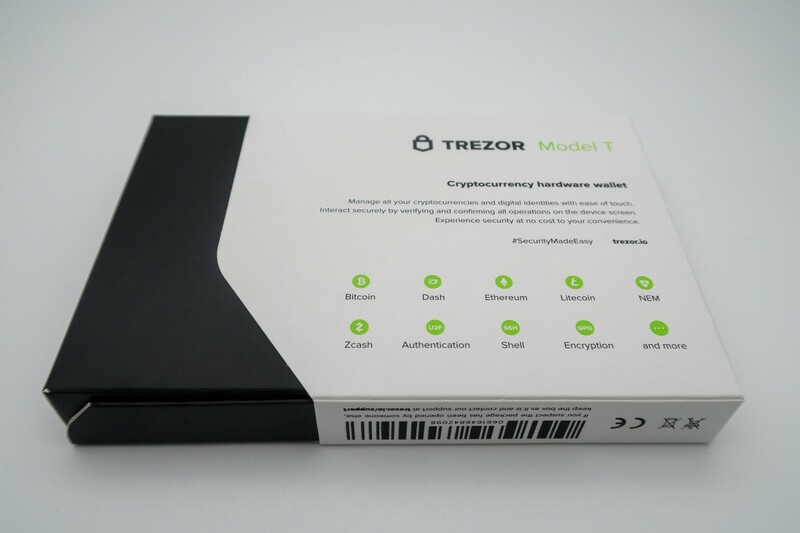 The TREZOR Model T is attached to the box thanks to embedded magnets. Now, feel free to take the device from its dock. The magnet is perfectly safe and will not harm or damage the device itself, or any accessories. Please, don’t forget to verify is the device’s seal is intact. The hologram should sit tightly over the USB-C port of the TREZOR. If it has been removed, it will leave marks on the device. In such a case, please contact our Support Team. The USB-C cable and other items can be found in the black box next to your device. Lift up the accessories box from the encasement and open it. Apart from the cable, you will find the Getting started guide and two recovery seed cards. Of course, stickers are also included. But that’s not all! See the black piece of plastic that was under your TREZOR Model T? It has a second purpose: it is a magnetic dock for your new device. Using the 3M double-sided tape on its backside, you can stick it to any firm surface. Attach your Model T to it, and you can see the screen with ease. Note: The 3M tape is very strong and cannot be peeled off easily. 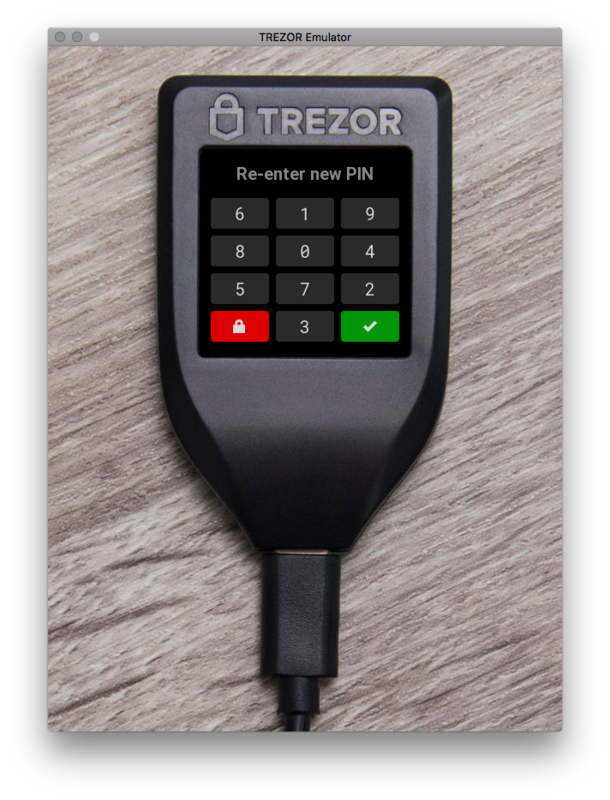 TREZOR Model T is compatible with all major operating systems. The device and TREZOR Wallet work with Google Chrome and Mozilla Firefox. 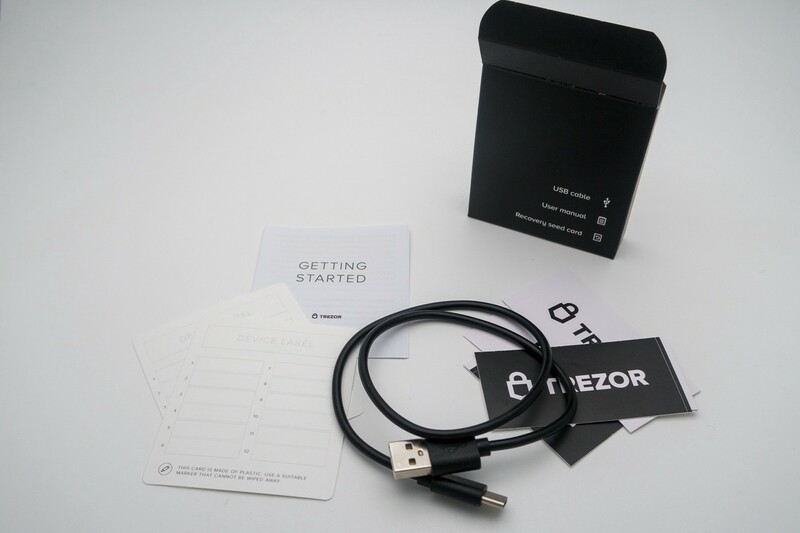 As guided by the packaging and the device, connect your TREZOR Model T and follow the instructions on the device. (Open trezor.io/start in your web browser.) 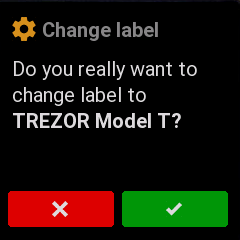 On the start page, choose TREZOR Model T as your product. I̶n̶ ̶t̶h̶e̶ ̶n̶e̶x̶t̶ ̶s̶t̶e̶p̶,̶ ̶i̶f̶ ̶y̶o̶u̶ ̶a̶r̶e̶ ̶u̶s̶i̶n̶g̶ ̶G̶o̶o̶g̶l̶e̶ ̶C̶h̶r̶o̶m̶e̶,̶ ̶y̶o̶u̶ ̶d̶o̶ ̶n̶o̶t̶ ̶n̶e̶e̶d̶ ̶t̶o̶ ̶d̶o̶w̶n̶l̶o̶a̶d̶ ̶a̶n̶y̶ ̶o̶t̶h̶e̶r̶ ̶a̶p̶p̶l̶i̶c̶a̶t̶i̶o̶n̶,̶ ̶t̶h̶a̶n̶k̶s̶ ̶t̶o̶ ̶t̶h̶e̶ ̶W̶e̶b̶U̶S̶B̶ ̶s̶t̶a̶n̶d̶a̶r̶d̶.̶ EDIT: Chrome disabled WebUSB and therefore all users will have to install TREZOR Bridge. If you are using Firefox, please install the TREZOR Bridge as requested. Windows 7/8 users, please read the FAQ at the end of this guide. 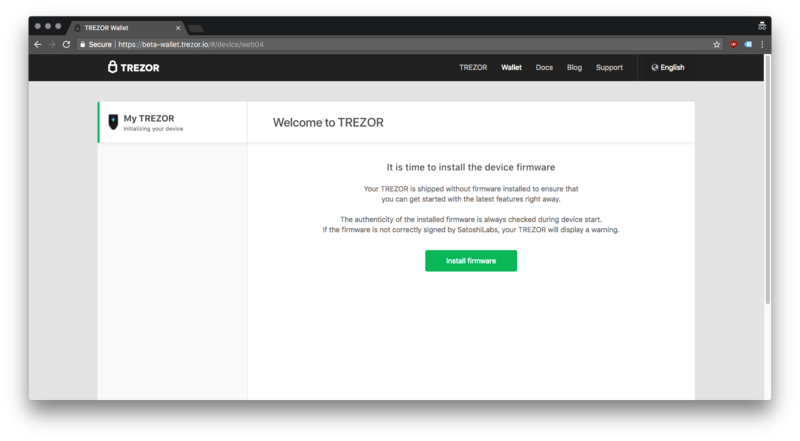 Once the TREZOR Wallet recognizes the device, it will automatically offer you to install the firmware for your Model T. Start the process and sit back and relax. Within a minute, your device will reboot and load the new firmware. 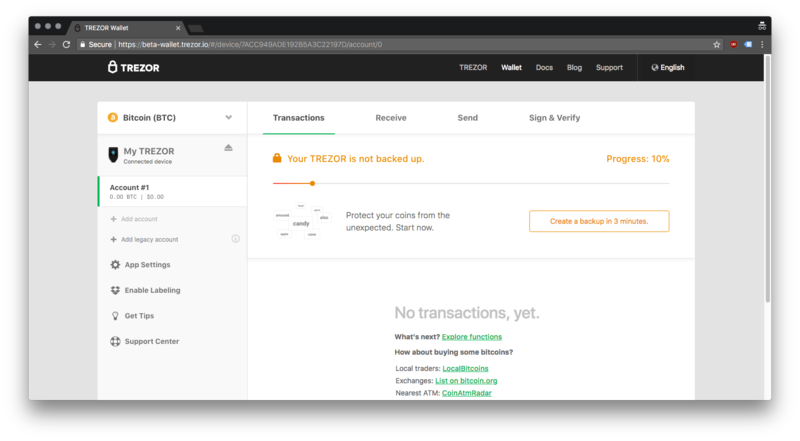 TREZOR Wallet will then start the wallet initialization process with you. 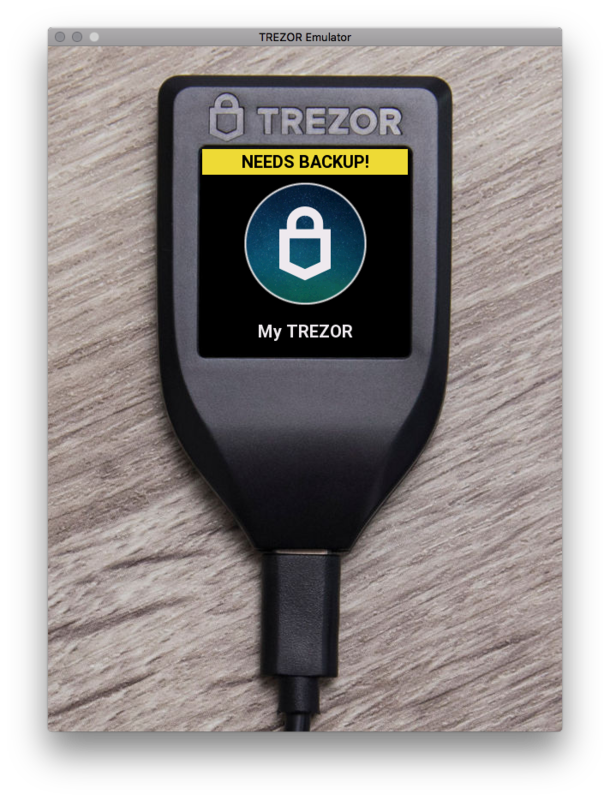 Once the firmware is correctly installed, TREZOR Wallet will ask you if you are a new user or you want to recover a wallet generated elsewhere. While the TREZOR accepts all BIP39 seeds and can restore an older wallet, we strongly recommend creating a new one with your Model T, unless you are sure that your previous wallet was secure. The TREZOR device is as secure as your recovery seed. If you import a compromised seed, even the Model T cannot protect you. If you choose to generate a new wallet, the device will process your request, and soon you will be brought into the all-new interface. There are a few steps left though. You are free to explore the Wallet, but we recommend you finish the onboarding process before you send any coins to the TREZOR Model T.
Once you are ready, please click on the prompt in the Wallet and create the backup of your wallet in the form of your personal recovery seed. The process is quick and straightforward. The Model T generates a unique, 12-word longrecovery seed for you, which will be displayed on the device screen. Do not disconnect your device during this process. If you do, you will not be able to view your recover seed again and will have to start over again by wiping the device. 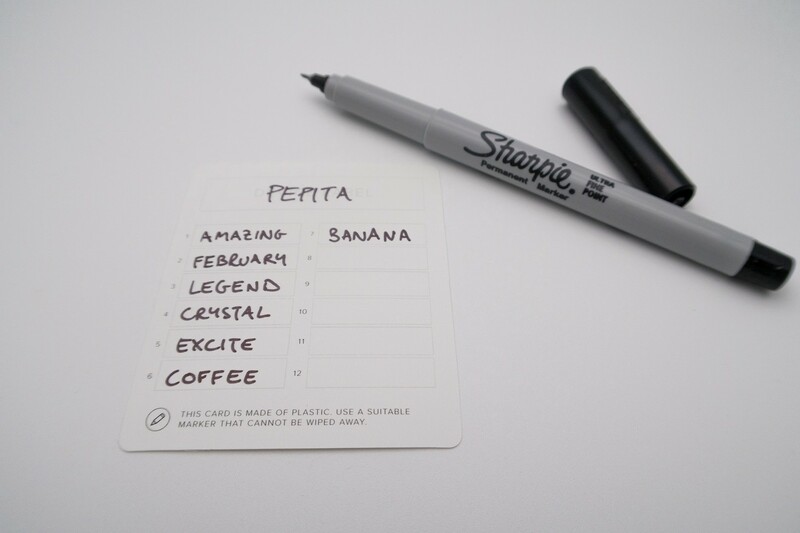 If you are planning to use the provided recovery seed cards, only use permanent markers, such as Sharpie. The synthetic plastic-paper cards are water and tear resistant. Remember to keep your card with the seed words in a safe location and never store it as a digital copy. We strongly discourage you from taking photos of your recovery seed, or to make any digital copies. Please do not write down the words into a text file on your computer, even if your computer is encrypted. Other dangerous scenarios are listed before the backup procedure in TREZOR Wallet. Done with the backup process? You can move on to a more creative, next step: pick a name for your TREZOR! Choose from the predefined samples or come up with your own. A unique name will let you differentiate between your TREZOR Model T and other TREZOR devices that you might have. 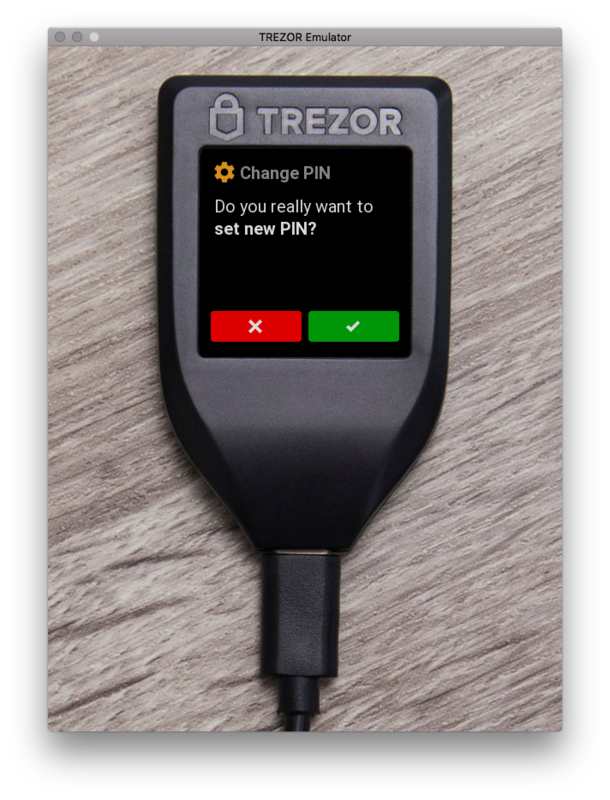 The next step is to create a PIN, which protects your TREZOR from unauthorized access. Use at least four different numbers. Try to avoid simple PINs like ‘1234’ or your date of birth. The maximum PIN length is nine digits long. During the setup process, you will enter your new PIN on the device touchscreen twice. Notice that the layout displayed on TREZOR changes with each new prompt. That is it! 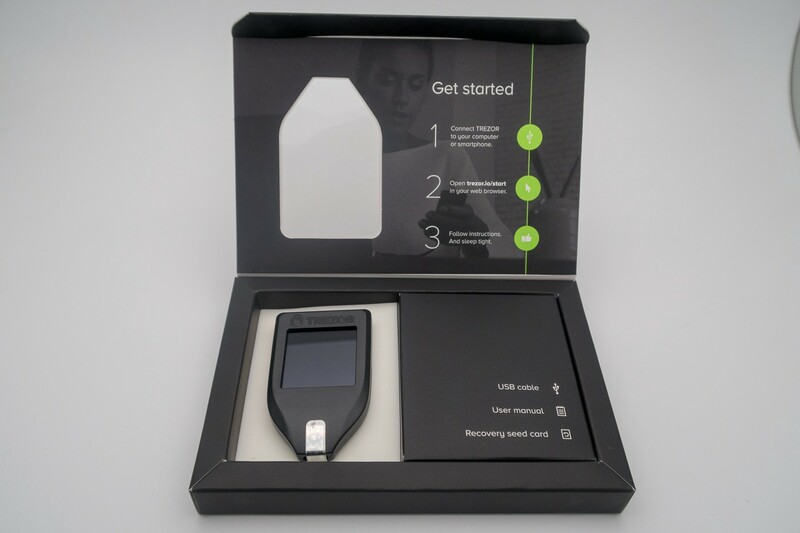 Welcome to your new TREZOR Model T. We hope that you will enjoy the device and the security that it brings you.